Balzer + Bray, 9780061953385, 40pp. 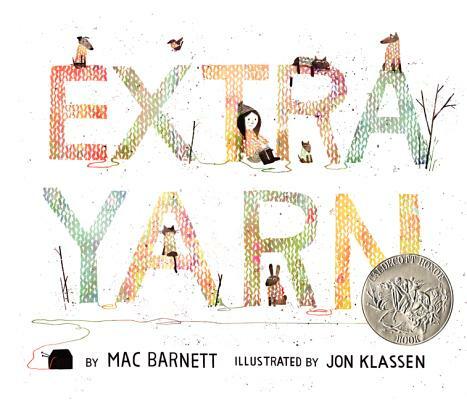 From bestselling and award-winning author Mac Barnett and illustrator Jon Klassen comes Extra Yarn, a Caldecott Honor Book, Boston Globe-Horn Book Award winner, and a New York Times bestseller. A young girl and her box of magical yarn transform a community in this stunning picture book. With spare, gently humorous illustrations and a palette that moves from black-and-white to a range of color, this modern fairy tale has the feel of a new classic. Fans of Oliver Jeffers and Peter Brown will love this book. Mac Barnett is a New York Times bestselling author whose books have been translated into more than thirty languages. His picture books include two Caldecott Honor–winning collaborations with Jon Klassen: Sam & Dave Dig a Hole and Extra Yarn. Among his other popular books are I Love You Like a Pig, illustrated by Greg Pizzoli, and The Magic Word, illustrated by Elise Parsley. He lives in Oakland, California. You can visit him online at www.macbarnett.com.